February 25, 2018 April 4, 2018 Nate Dunn, M.S. Power data has transformed what it means to both describe and prescribe effort. Training lexicon like Functional Threshold Power (FTP) enables intensity prescription down to the watt while providing a language to describe cycling performance in great detail . Understanding the world of cycling in watts and kJ’s has huge advantages, but relying on ride data alone to plan training and race strategy is a mistake. When watts are our singular focus we fail to respect the role our perception of effort plays in shaping our performance on the bike. 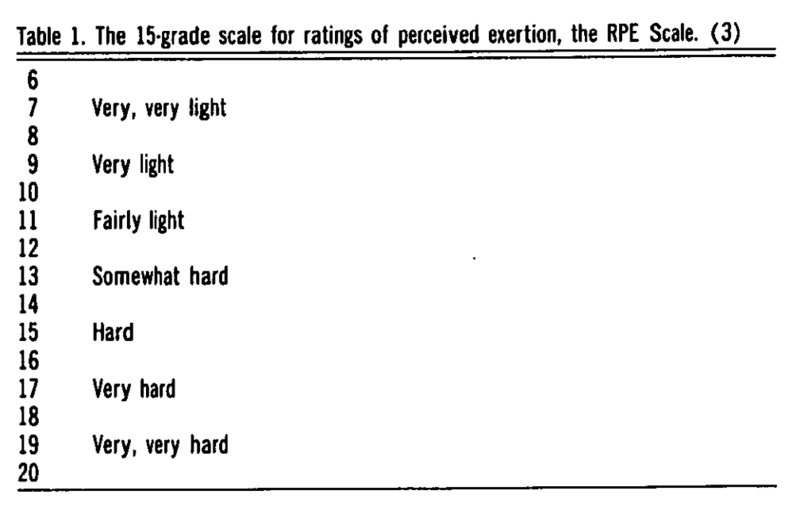 Stress, ambient temperature, caffeine, and many others; they all contribute to our rate of perceived exertion (RPE). If RPE had no bearing on performance we might dismiss it, but in many cases, it defines our best performances [2, 3]. Because RPE is so important, we want to integrate it into everything from workout design to race strategy. Most of us are proficient in the language of power, the next step is to become more fluent in RPE. The language of RPE was first developed by Swedish psychologist, Gunnar Borg, who mapped out the original scale modeled off heart rate (HR) . With a resting HR around 60 bpm and maximal HR around 200 bpm he came up with a scale of perceived effort that ranged from 6-20. Borg, G.A., Psychophysical bases of perceived exertion. Med Sci Sports Exerc, 1982. 14(5): p. 377-81. The RPE system looks nice but how well does it work in approximating specific training intensities? In short, really well. A recent study found a very strong relationship between “RPE and exercise intensity, assessed by blood lactate, and heart rate…” . In other words, when subjects are doing laboratory based assessments of different training intensities such as their lactate threshold, the intensity that a subject perceives, most often lines up with the actual intensity being measured. Power meters are fancy and accurate, but RPE works pretty well too. While the 20-point scale does a great job of providing a system to describe a wide range of exercise intensities, it also has a tendency to be a bit overly complex. For this reason, we’ll break down cycling effort on a simple scale of 1-10. 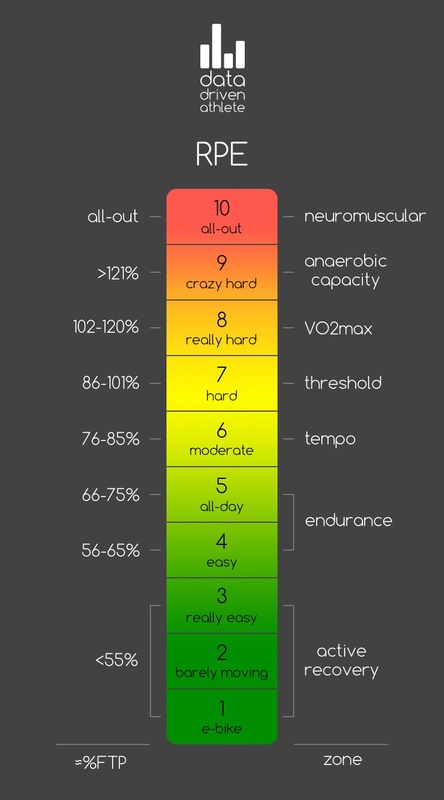 The graphic below illustrates how our RPE scale might translate into the common languages of training zones and % FTP. From fondos to road races, learn why our cycling coaching is among the best in the industry. Be the first to know about new blog posts while getting inside training tips delivered to your inbox. No spam, ever, I promise. Allen, H. and A. Coggan, Training and racing with a power meter. 2nd ed. 2010, Boulder, Colo.: VeloPress. xviii, 326 p.
Van Cutsem, J., et al., The Effects of Mental Fatigue on Physical Performance: A Systematic Review. Sports Med, 2017. 47(8): p. 1569-1588. Noakes, T.D., Time to move beyond a brainless exercise physiology: the evidence for complex regulation of human exercise performance. Appl Physiol Nutr Metab, 2011. 36(1): p. 23-35. Scherr, J., et al., Associations between Borg’s rating of perceived exertion and physiological measures of exercise intensity. Eur J Appl Physiol, 2013. 113(1): p. 147-55. Previous Does Beet Juice Really Make You Faster on the Bike?